India opener Virender Sehwag stormed into the top five in the Reliance Mobile ICC Player Rankings for Test batsmen after scoring a superlative double-century against Sri Lanka in the third Test in Mumbai. 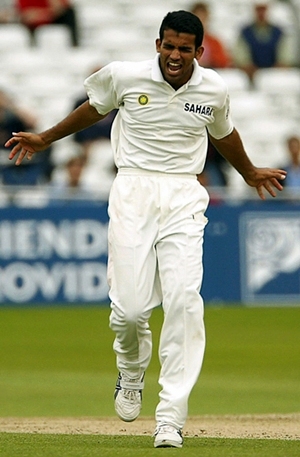 Sehwag's 293, which turned out to be the cornerstone of his side's victory that ultimately gave India the number one position in the ICC Test Championship table for the first time, rocketed him 14 places to fifth position, which he now shares with Pakistan captain Mohammad Yousuf. 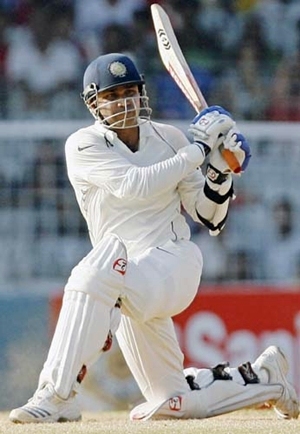 It is the first time since October 2006 that Sehwag has returned to the top five. From the Mumbai Test alone, the 31-year-old from New Delhi gained 91 points, which makes him one of the six batsmen above the 800-point mark. It was an outstanding and memorable Test series for Sehwag, who not only scored 491 runs in four innings but also gained 16 places in the batting table after starting the series in 21st position. Also on the charge in the latest player rankings, released on Tuesday, are New Zealand batsman Ross Taylor and West Indies captain Chris Gayle. 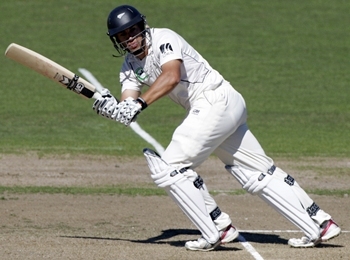 Taylor, who scored 30 and 97 in a losing cause to Pakistan in the Wellington Test earlier this week, vaulted eight places to achieve a career-best ninth position, while Gayle, who scored 26 and 165 not out, jumped six places to share 22nd spot with Sri Lanka's Tillakaratne Dilshan. Also moving in the right direction is the India pair of Rahul Dravid, 16th (up by two places), and VVS Laxman, 19th (up by one place), while Australia's vice-captain Michael Clarke, who scored 71 and 61 not out, also climbed a rung, to fourth. 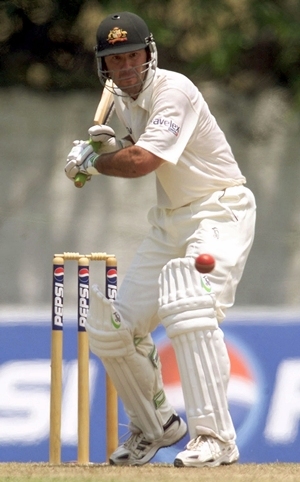 However, Ricky Ponting dropped out of the top 10 for the first time since October 2002. Australia's captain, who started in ninth position, slipped three places to 12th after scores of 36 and 20 in the Adelaide Test against the West Indies. Meanwhile, Australia needs to beat the West Indies in the third and final Test starting in Perth from December 16 if it wants to end 2009 in third position. Having started the year in number-one spot, Australia will slip behind Sri Lanka in fourth position if it loses the Test or the West Indies holds it to another draw. If the series ends in a 1-1 draw, Australia will drop to 112 ratings points (three behind Sri Lanka) while a 1-0 series result will leave Ponting's side on 114 ratings points (one behind Sri Lanka). Unlike the ODI Championship table, the Test Championship table is only updated at the end of a series. 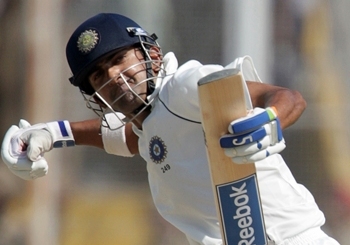 Gautam Gambhir leads the batting table with Sri Lanka duo of Mahela Jayawardena and Kumar Sangakkara second and third. India maestro Sachin Tendulkar conceded two spots and is placed 18th after scoring 53 against Sri Lanka, in his only outing on his home ground. Other notable batsmen outside the top 20 to make upward movements are Mahendra Singh Dhoni 30th (up two places), Dwayne Bravo, 40th (up five places), Umar Akmal 43rd (up nine places), Brendan Nash 51st (up 12 places), and Shane Watson 58th (up 12 places). 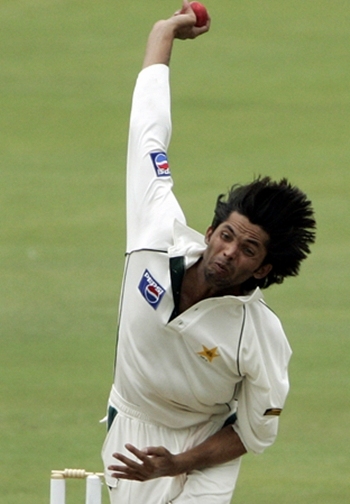 In the ICC Player Rankings for Test bowlers, Pakistan pace and spin combination of Mohammad Asif and Danish Kaneria are on the charge. Asif, who rattled New Zealand in Wellington with match figures of 9-107, jumped five places to achieve a career-best fourth ranking to date while Danish rose six places to 15th after figures of 6-80. India fast bowler Zaheer Khan, who took match figures of 6-142 in the Mumbai Test, gained a valuable place which has now put him inside the top 10, while Peter Siddle, who was the ICC Emerging Player of the Year 2009, slipped seven places to 23rd after claiming just one wicket in Adelaide. Also on the slide are Rangana Herath 30th (down by three places) and Nathan Hauritz 49th (down by 10 places). The list is still headed by South Africa fast bowler Dale Steyn with Australia's Mitchell Johnson second and Muttiah Muralitharan of Sri Lanka third. There is no change in the ICC Player Rankings for Test all-rounders with South Africa's Jacques Kallis leading the field by a comfortable margin. Team India No 1, say congrats!